Search among all our options the product that best suits your clients to offer them comfort and design, creating a comfortable and welcoming atmosphere. Why buy my catering tables in DESKandSIT? All our hospitality tables are composed of a structure and a board. Among them there are different materials to choose from and in case the combination or measurement that you want is not available you can consult us to be able to offer you the best alternative in each case. Our catalog is wide and heterogeneous in measurements, materials, colors and prices so that you find the table that best goes with your store. Are you looking to create a vintage atmosphere? 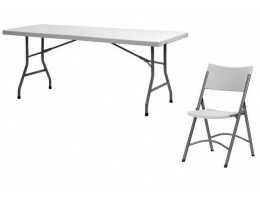 Do you just have space and need folding tables? 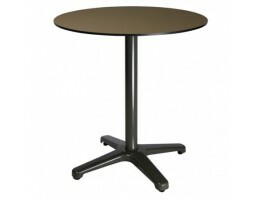 Do you want to choose between our round board tables? All varieties of tables you can imagine are in our nine sections of tables of hospitality. The wooden tables are one of the big demanded. More and more bars, restaurants or pubs decide to incorporate them in their premises for their versatility and timelessness. We have of pine wood tables, white or tropical wood among others. Our metal tables combine with all types of establishments, have great strength and some like aluminum are easy to transport. More and more cafes and bars prefer a round design board that takes better advantage of space and a more casual style to the place. Among them you can find a variety of colors, materials and heights. For a more sober and classic style the square and rectangular table top is the best choice and the most used by restaurants of design. If you do not have enough space in your establishment or prefer to adapt it to the number of clients each day, ideally you should choose this type of folding, collapsible or stackable tables Easy to use they are also very light and adapt to all kinds of situations. Preferred by bars. The high tables give a more casual style in addition to providing more space. In our catalog you will find many varieties among which is the increasingly demanded high bar table with use both with stools and standing. The central foot tables are chosen by many of our customers due to the convenience of having only one foot and being able to accommodate a larger number of guests. . Its design, although already classic, continues to be successful in the most modern restaurants and bars. The vintage tables in wood or metal have become in recent years indispensable elements to achieve a cozy and avant-garde style in any cafeteria or restaurant. We have the material of the main national manufacturers of professional hotel furniture, such as RESOL, EZPELETA, MUEBLES ROMERO, ALUTEC, ISI CONTACTR, etc. We also have import material for the replicas of the design classics. Engage your customers by offering the best with our materials more comfortable and more modern designs. Whatever your establishment, a rustic tavern, a café, a vintage or a terrace chill out, in our catalogue we have the proper chair that will combine with your tables of hospitality. Do you wonder where to buy furniture for a restaurant? 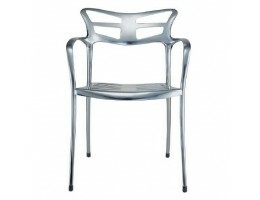 In DESKandSIT we know the features that require the chairs of the hospitality industry such as lightness and resistance. We guarantee a wide range of chairs with innovative designs and materials to care for your clients to enjoy their stay in your establishment and want to repeat the experience. Discover our original articles for a furniture for restaurants modern, metal chairs & bar chairs vintage cheap in one of our 6 categories of chairs of hospitality. Chairs with arms are designed to ensure the comfort of your customers. In addition, they will give your restaurant or cafe a touch of sophistication that you can combine with our catalog. One of the essentials is the armchair bistrot, but if you are looking for an industrial style, you can get the fantastic armchairs director. The metal chairs are increasingly in demand because of the advantages it offered as its lightness in the case of those made of aluminum or stainless steel, and for its ease to clean, a factor very relevant in the hospitality industry. Our catalog of wooden chairs is very heterogeneous, it is found different types of wood, such as pine, the tropical or the hague. Include the chairs of patchwork, and the banks vintage. This exotic material from the palm trees of Indonesia and west Africa and it is a material very much used in chairs outside both in its natural version as in the version of synthetic rattan. The variety of designs that allow for its components, as well as its resistance and durability, makes it the perfect choice for furniture hospitality industry in terrace. Offers maximum space to your clients with the stacking chairs of DESKandSIT. In this way, though they are few diners, there will be empty chairs and you'll be adding them as they come. They are also perfect for terraces. Choose from our range of chairs more flirty. We have the style of Louis XV made in the current materials, the replicas of the design tulip, or retro style as our chair of beech wood with finishing in varnish. The best quality and innovation at affordable prices. Why buy chairs hospitality DESKandSIT? Since 2011 in DESKandSIT we offer a catalog heterogeneous in chairs of hospitality , that offer the maximum guarantees of quality thanks to brands such as Resl, Isimar, Vondom ,or Ezpeleta. The delivery service is fast, the prices affordable and our customer service team composed of experts in the hospitality sector, are some of the features that each year make us grow and earn the trust of our customers. Do not hesitate and if you have not yet decided by the chair of hospitality for your establishment, please contact us by filling this form or through the mail deskandsit@deskandsit.com you can Also call us at phone 902090785 and we will advise you happy. Enjoy the advantages of buying on DESKandSIT. 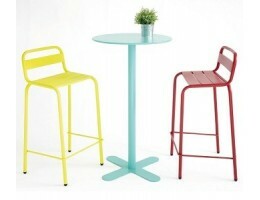 Wide range of high bar tables and stools designed for outdoor and indoor use. 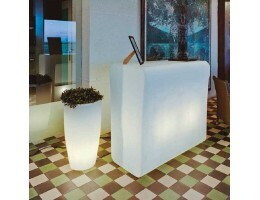 Ideal for bar terraces, swimming pools, beach bars, as well as office, chill out, etc. The high tables to eat standing or with stool, are a good alternative in the area of your premises that you can not put a low table for space, but offer the customer one more point, and more comfort and intimacy than at the bar. Everything you need for your premises or business. Find among our proposals the product that is in accordance with the design and characteristics of your premises. Do not lose your customers because of the cold. The terrace can be well conditioned, and that depends on you taking advantage of your terrace all year round. Define the perimeter of the terrace: cover the sides of your terrace with curtains, screens or windshields and, in winter, condition the terrace with gas stoves or outdoor electric stoves for the hotel industry. The terrace is the first thing you see in a restaurant. Whether it's a bar, a restaurant, the terrace of a cafeteria or a local bar, the first thing the client sees is his terrace. From DESKandSIT we will help you to have the image you want, always with the most competitive products in terms of price, offer and quality. In this section we present examples of terraces configured with: - sunshades: we have parasols from 2 to 5 meters, with different shapes (round, square, rectangular sunshades, with the mast centered and off center). 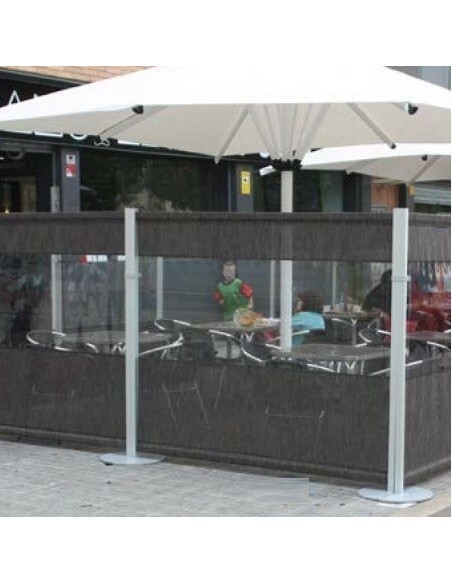 - Separations for your terrace: as windshield curtains that adapt to the sunshades, but also dividers or standing screens that you can complete with flower boxes, with your local logo, etc. 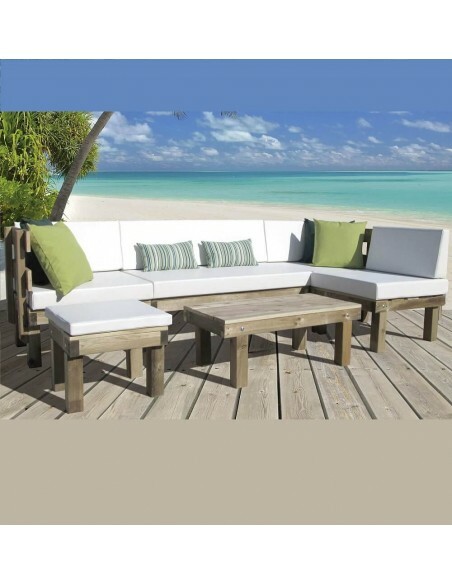 Complete the terrace with outdoor terrace furniture designed for hospitality that suits the style of the place: tables, chairs, high tables, stools, sofas, outdoor bars, illuminated furniture. In our catering section you will find in different sections the necessary material to furnish the terrace with different styles and budgets. We also have a wide range of products for immediate delivery, to be able to fully equip the terrace in a few days. 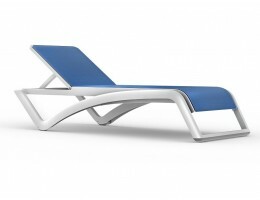 Get to attract customers with the most comfortable sun loungers and modern design. 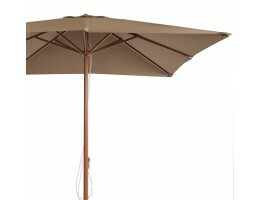 You can combine them with the auxiliary tables and with the hospitality umbrellas. It is important to know the main characteristics of the deckchairs to be able to choose the most suitable model: the weight of the sun lounger, the resistance and its comfort that depends on the material in which they are made. We have a wide variety of sunbeds with a wide range of prices and very careful designs to improve the experience of your customers. For the terraces that must be collected daily, an essential point is that the chairs are piled up and that their weight is the minimum possible. In this case, resin loungers are recommended, such as the classic MASTER or MARINA lounge chairs and the most modern SKY loungers or the aluminum and textilene loungers, such as the legendary BARCELONETA lounge chair. Rattan loungers combine the most classic aesthetic with the use of resin in the same product. They are very resistant loungers that allow to combine the finish of the terrace chairs with the same color, material and finish as the loungers in the pool, to give a uniform image. We have collections of hospitality furniture that incorporate pieces of all these sections. Choose from our range of most innovative sun loungers. We have loungers with very current designs to differentiate themselves from the rest of the pools. Always proposing sunbeds with a high level of quality and durability (essential by the sea or in contact with the chlorine of the pool) without forgetting the aesthetic at very competitive prices. We can not forget the new trends. If you have space, what better way to offer your clients double sunbeds or canopy or canopy beds. Clients are impressed with the intimacy they generate. Not to mention, you get a very elegant terrace image. You can find double beds made of aluminum and tropical woods. If, on the other hand, you have a small space, or you are looking for more rotation in your pool, you can combine the lounge chairs with folding hammocks. Aesthetically they are very attractive, and at the same time it is an economical and practical product. The folding hammocks can also complete the terrace of a bar, offering a more chillout atmosphere. We also have the most classic metal hammocks in the French style. Dress up your colorful terrace with aluminum hammocks to create the most cosmopolitan lounge. The swimming pool and beach terrace areas can be completed with sofas and chillout poufs, provided they are made in the appropriate fabrics. We have upholstered sofas in nautical vinyl. This resistant fabric allows to offer these products at the foot of the pool or beach without sacrificing comfort. Why buy sun loungers at DESKandSIT? In our catalog we have the best brands which allows us to advise you so that you can incorporate the deckchair or hammock that best suits your needs into your business: the legendary Spanish sunloungers brands Resol and Ezpeleta are complemented by the Portuguese sun loungers by Joluce and the most modern sun loungers by ISIMAR. Do not hesitate and if you need help we can contact us by filling out our form or by email. You can also call us by phone and we will gladly advise you. Contrat et mobilier de restaurant: canapés, tables et repose-pieds latéraux pour canapés intérieurs et extérieurs. Outdoor patio heaters and misting fans. 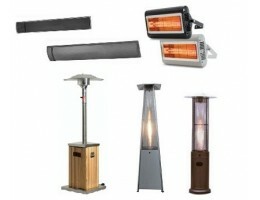 Complete the design of your terrace with our online catalog of stoves and outdoor patio heaters. Selection of gas and electric stoves. Models of fixed and portable stoves. 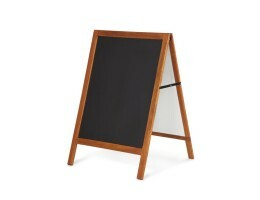 Wide range to cover the needs of each bar or restaurant. Depending on the area where the terrace is located, you can use fixed or portable stoves to attract customers day and night and during the winter. Combined with the side curtains, you can have a cozy atmosphere all year round. Mobile gas stoves for the terraces that do not have electric current or do not have enough power in the electric installation. Fixed electric stoves (wall hanging): infrared electric stoves: the fastest heat; or electric stoves without light: higher performance and without UV light. Different powers and deposit capacities of watter to be able to have the terrace conditioned the greatest number of hours without worries. Fixed and portable rotary head models. Extensive catalog of auxiliary tables to complete the design of your premises, bar, restaurant or business. Tables for use in different areas: tables for waiting rooms, coffee tables for sofa area, tables to accompany puffs in areas informale type chilloout, etc. 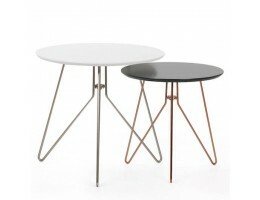 Tables for hotel and contract. Everything you need for your premises or business. Aluminum stools of classic and modern design. Furniture in different materials to adapt to different styles of interior design: aged vintage tables and stools with retro design, aluminum, lacquered wood, etc. Find among our proposals the product that is in accordance with the design and characteristics of your premises. Section where we present accessories catering for signaling, reporting and order. - Separations (poles and ribbons / strings) to mark lines, walkways, etc. On the web, you will find the selection of the most common signals. If you need a different check. Examples of such facilities and cafes where images of real cafes proposals relate to products (chairs, tables and stools) that fit the style to help you decorate your new business or renew or upgrade their premises. 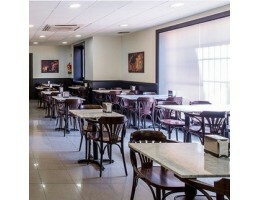 Contract restaurant and bar furniture TAX FREE for billing and delivery outside Spain - for professionals with "VAT NUMBER". 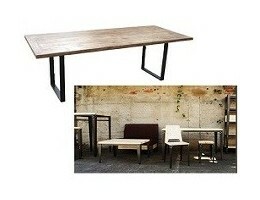 Catalogue with tables and chairs for restaurant as vintage tables and chairs furniture online and furniture for events. By default (without registration) prices include SPANISH VAT (21% included). The price of transport that appears by default on the cart is the one to deliver to mainland Spain. For other destinations, indicates the delivery address when registering and the transport rate will be updated.